I cover a lot of new site strategies and ideas on this blog for SEO. What I don’t tend to cover, is how we can grow traffic on sites that are already ranking/getting organic traffic in a very quick, and effective manner. 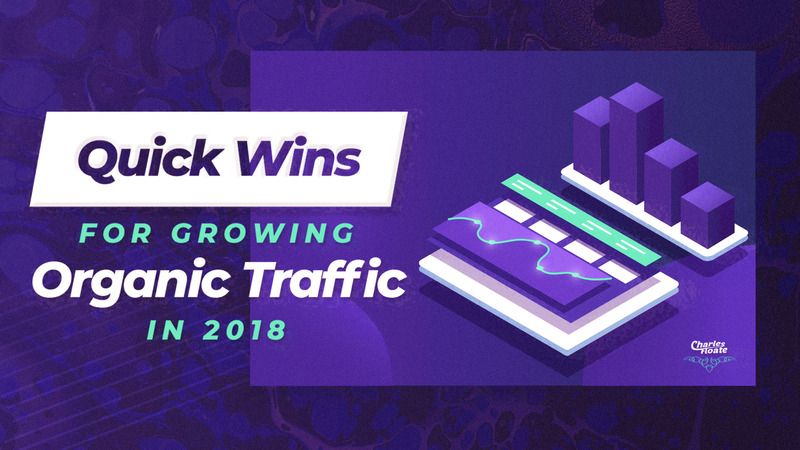 In this blog post, I’ll be going through some quick win based tactics that you can use to quickly grow organic traffic/rankings in 2018. If you’d like to get these kinds of tips to your inbox, every month, then join my email newsletter here. I think you’ll enjoy the testimonials I’ve acquired too. We’ve seen some crazy results from finding content/pages that have decent potential to generate organic traffic already, and finding new ways to re-optimize them. If you can simply update a page that is already ranking and already has ranking signals.. Then simply making it a better piece can have dramatic results. Likewise if you can find keywords a page is already ranking for but isn’t solely targeting, you can simply re-optimize or re-build a new page to optimize around these keywords. Changing the URL Structure – From our testing, doing a straight internal redirect, we have seen next to no loss in link juice between internal pages. If you start doing redirect chains though, you can expect to see loss of link juice. Adding Additional Pieces of Keyword Focused Content – We recently did this for a client’s money page. We simply added 3 extra check boxes on to the page with H3s around the 3 target keywords and 50 or so words for each segment. We saw position gains for each keyword we had targeted, and it literally took 10 minutes to do. Extending Content Length – Comparing your content vs. a competitor’s content length is always a good idea. Google’s content quality algorithm’s still aren’t really up to scratch, and they had an obvious bias towards long form content. Seeing how long your competitor’s piece is vs. your own, then extending it until you out do them can have fantastic position gains. Adding/Optimizing Rich Media – We’ve simply added images or videos to 2k – 5k word blog posts, where there were none before (Some clients writers have been more than just questionable) and seen immediate jumps. Again, this is likely due to Google’s content quality updates favouring engaging content over walls of text that likely have high bounce rates. Updating The Date – Simply adding some additional content and updating the date can help trigger freshness algo’s to reevaluate a page. Whilst working at my agency, I noticed on one of our clients sites that we were ranking page #2 to page #9 for some pretty big keywords, that could offer a lot of value. I decided to split the current page into 3 different pages so that we can be more focused around the individual keywords, rather than attempting to have one page rank for all of the variants. Even though they were very similar keywords, they had slightly different intents. As you can see, once the new pages were indexed and we’d managed to successfully split the topic of the 1 main page into 3 separate ones.. We saw immediate jumps and ranking boosts for all of the keywords we had identified. 99% of the websites I see on a day to day basis aren’t effectively or properly utilizing internal linking. Most of the time people find it difficult to be able to see the internal links on your site, find opportunities or build internal links. A lot of SEOs have gotten very lazy with their internal link building, and it loses the entire site power and potential beneficial rankings. Before I cover how we find them, first I want to make sure you understand how to build them. I recommend building 100% of the internal anchors you choose being keyword based, but never use the same keyword more than once and use the exact match keywords on the highest power pages in terms of links to them. You can get away with much higher levels of internal anchor ratios than you can with external link building. Now, say we wanted to find internal linking opportunities quickly from pages already on our site around this keyword. Pro Tip: You can also run these queries en masse with ScrapeBox (or GScraper) and format spreadsheets for larger scale internal linking campaigns. This gives you several pages to be able to get links from. 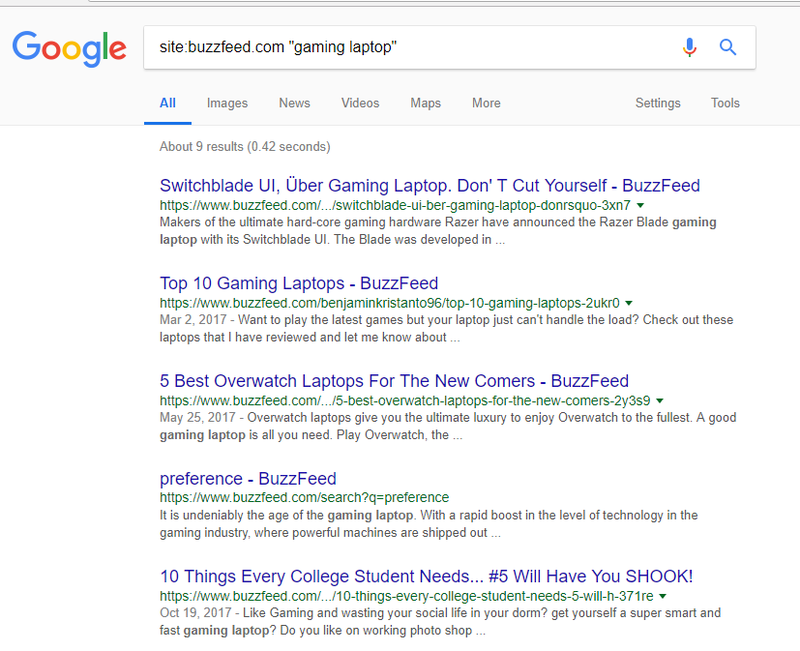 As I said above, I don’t recommend just using the “gaming laptop” keyword on these pages.. You can use that keyword but also use other variations, OR if you have different keyword topics, such as “gaming ultrabooks” for the same page, you can use these in the search operators too. Whenever using pre-existing content, I recommend making a small overall content update and not JUST adding in a new link. You can also run these search operators whilst also using the Moz or Ahrefs Toolbar to be able to see the RD/Link counts. Then choose your most powerful pages with the most powerful keywords for your page, to have the strongest effect. We recently re-optimized the internal linking of a client site. They had a TON of content they’d put out but hadn’t utilized internal linking at all, we identified key pages that would significantly help grow our revenue and went out using existing content pieces (The same tactic as above) to identify and build internal links. We saw a nice bump in week over week traffic and specifically around 2 high value pages that we had specifically targeted, hence the very nice revenue and conversion rate bump we had. Despite what a lot of people say, meta titles are still a pretty big ranking factor and for how long they take to optimize, should be done correctly. This is a super easy technique to do, and one I had already explained in my ECommerce SEO Guide. The premise is you simply note keywords the page is already ranking for, and re-optimize the meta title to also include the variants you’re lower down the page for. Note: Make sure if you’re using root categories (that have sub-categories) that you’re choosing the “Exact URL” setting in Ahrefs, so you don’t get all the sub-category keywords too. This title now incorporates all of the keywords we’re ranking positions #7 – #3 for and would hopefully be enough to knock a few of those keywords up a notch. It only took us a few minutes to do, as well. If you’re in the ECommerce space, then you’re going to want to be having an SSL certificate. We’ve seen massive correlation in buyer based search terms and the use or lack thereof of a secure SSL certificate. We’ve also found even better rankings from using an EV SSL certificiate, in my opinion, this is likely due to the fact of it being a trust signal. Now, my theory is that EV SSL Certificates are a huge trust signal in buyer intent related keywords. Anything with buy, cheap, best, purchase etc.. related terms that people are looking to actually make a purchase through. Having an EV SSL in place intrinsically links a real world company (and encrypted purchasing/data transfer) to the website a user is going to buy off. It’d make sense for Google to rank sites that they can confirm are real businesses with users that are wanting to buy products, helps lessen scams etc..
We have a client that’s domain was registered in 1998 but haven’t had the best track record with developers and after over a year of pestering, we finally managed to implement an EV SSL certificate on to their site. We didn’t do much more than our usual work in October, we were mainly focused on making sure the SSL installation went smoothly, due to this specific client being so very wary of big development changes. In the end though, we saw a nearly 20% jump in organic traffic and our conversion rate also jumped, likely due to the big green padlock being a good conversion rate signal for buyers. One of the first things I’ve trained myself to do when evaluating a site is identifying and analyzing the most powerful links the site currently has. This can not only give you an insight into what kind of links a site is able to acquire, but also gives you an opportunity to affordably grow a site’s traffic by building on what already exists. Building links, social signals or asking the site to update the content/page can have dramatic effects on how powerful a link that a site already has is. We recently on boarded a client that had links from Forbes, The Financial Times and several other large finance publications. Now, a lot of these links were pointed at the homepage or other internal pages we weren’t trying to rank for.. BUT we did identify 3 links pointed at our main money page that were extremely powerful. The authority sites they were on weren’t internally linking back to them. They didn’t have any social shares or tweets or anything. They didn’t have any external links built to them. So, we did a super easy tactic where we built a few links to each of those links (These were mainly cheap guest posts we found, paying around $70/link) and dripped social signals over a few days whilst the links were built. We saw a 25% jump in traffic to this specific money page. Adding an extra 500 pageviews/week at an additional cost of just $700 – Bear in mind, each conversion on that page is worth £200 – £400 for our client. I hope you enjoyed this post. As I said at the start, if you’d like to get more of these kinds of tips then why not join my email newsletter here. If you have any additional tips to share, why not drop them in the comments down below? Excellent tips. I have to implement a few of these as well. (those that aren’t already implemented). Glad you got them, thanks Adrian! Been working a treat on old aff. sites. Glad you enjoyed it! It’s so cheap, and so easy. And there is SO many links out there in 2018. What are your thoughts on adding a block of links at the bottom of each post with a heading “Related Posts”? Bad idea. I dislike using more than one link per 50 words, and sticking them in with no content surrounding is generally a bad idea. Even using Related Post plugins would be a bad idea? Maybe nofollow it, but use it to keep people on the site. Although I don’t usually seem them working very well unless it’s click bait type content. Not to mention that WordPress’s related posts runs database queries every time so it slows down your load time massively. I can personally attest to the interlinking subject covered above. I’ve been using this same method and got some pretty simple and quick wins from it – across all of my clients’ sites. Great post-Charles, I look forward to your future posts! Thanks Justin, it does work a treat! How you split the existing website page into 3 different pages, as its already index, after splitting- Are these pages may have duplicate content? I have a page with about 15,000 word count and already index and rank for several keyword, but at google 2nd -8thpages. I am interested to split this page . Pls guide me. Charles, do you think it might cause keyword cannibalization?